EuroBeam looks much the same as many other Windows programs, with a menu at the top, toolbar under, status line at the bottom and Project Manager to the left. It runs on Windows XP, Vista, Windows 7, 8 and 10 (32-bit or 64-bit) systems. You can choose the font(s) used to display and print calculations. A larger font is easier to read; a smaller font shows more information without scrolling - the choice is yours! 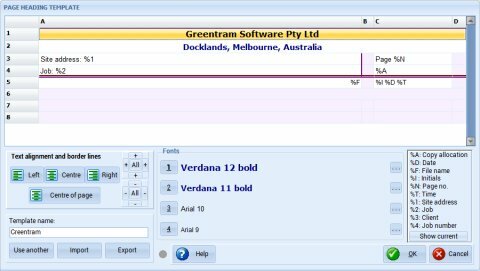 EuroBeam lets you choose from one of 24 colour schemes (themes). These screenshots use the default Luna theme. You can see them all on our themes preview page. A EuroBeam project is made up of one or more 'items'. An item can be a steel or timber beam, steel column, timber post or stud or text page. Each item calculation appears in a separate window. You can edit items by double clicking on the window, clicking on the pen icon on the toolbar, selecting 'Edit' from the menu or by pressing Alt+E - one of these should suit your preferred way of working. 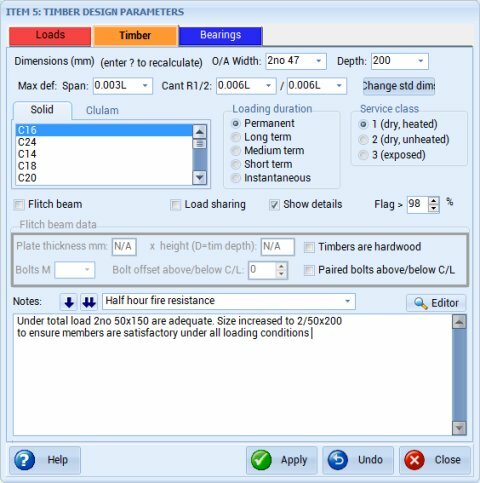 In EuroBeam the load, steel, steel bearing, timber and timber bearing data is entered in a multi-page modeless dialog. Click the appropriate tab to select the required page, enter the data, then pressing 'Apply' commits any changes that you make without closing the dialog, and you see the updated calculations in the corresponding window. 'Undo' restores the data to what it was before you started editing or last pressed 'Apply'. 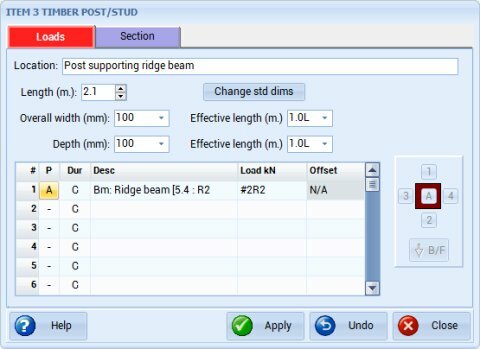 So to work out a typical beam you enter the loads, click on 'Apply', click on the Steel tab (see below) and make any changes, then 'Apply' again. The required size on the button immediately under 'Consider' (see below) - you can click on the button to manually choose an alternative section, if you don't want the one that the program has selected. 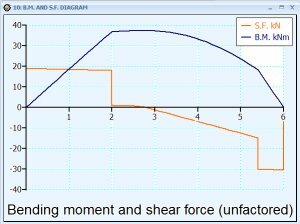 Then click on the 'Bearings' tab (see below) and change the bearing details as necessary. Click once more on 'Apply' then close the dialog and you're done. The options on this page relate to steel beam calculations. Amongst other options you choose the section type and steel grade, the minimum and maximum acceptable section widths and whether EuroBeam is to select the lightest or shallowest suitable section or check the one you have chosen. As elsewhere, you can add your own notes to the standard calculation. 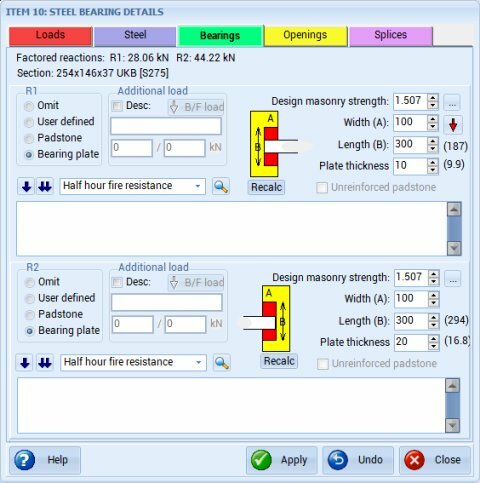 EuroBeam lets you size simple padstone and bearing plate bearings for your steel (and timber) beams. 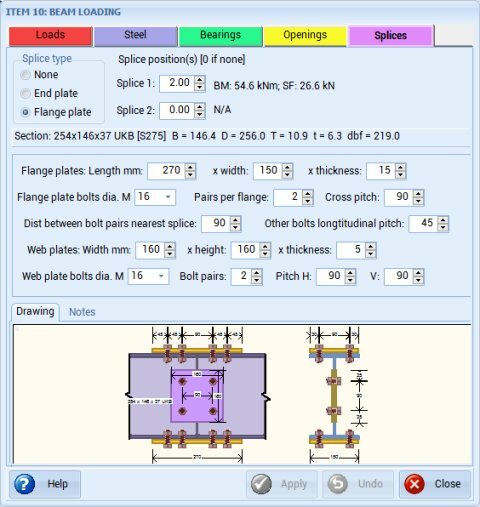 For I-section steel beams, EuroBeam lets you check beam web openings (not shown) and design flange plate and end plate splices. 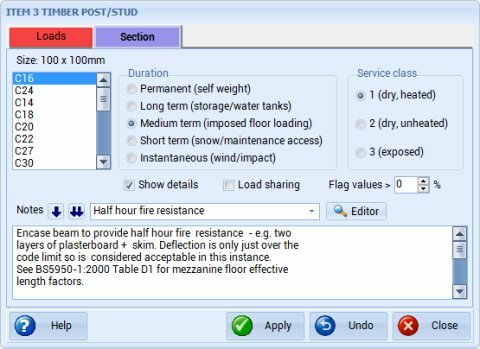 As with the steel page, this page is where you enter design parameters for timber beams, including the grade of timber and loading duration. If you enter the member width and depth the member will be checked; if you enter a width or depth of '?' the program will calculate the required value. 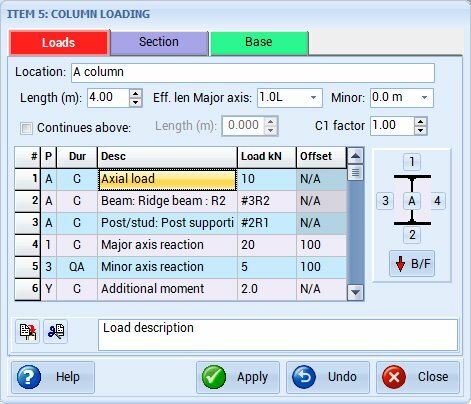 Steel column loads are entered on the first page of a tabbed dialog. You can enter axial loads or loads that create moments and also enter additional moments acting on the member. 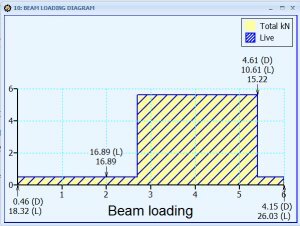 As for beams, EuroBeam checks your choice of section or selects the first suitable lightest or shallowest section depending on your choice (on the second page, not shown here). The third page lets you enter baseplate design parameters. 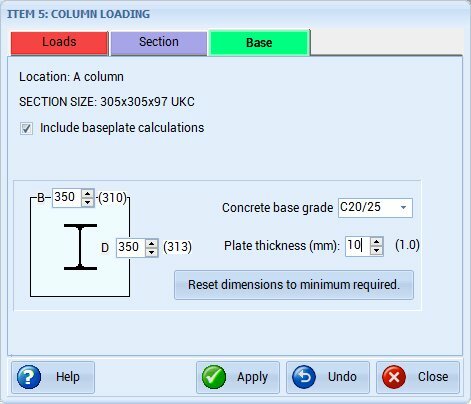 Column base plates are sized using the equivalent area method. 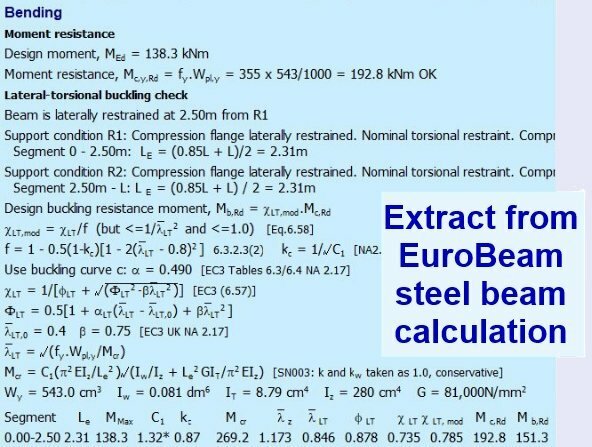 EuroBeam determines the minimum required size from the applied load and concrete strength then rounds this up. 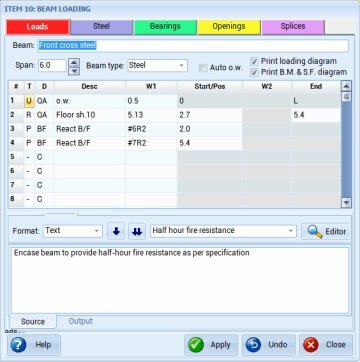 EuroBeam includes a basic text editor that will allow straightforward pages to be created. Extra tags within the text handle tabs, underlining and overlining (for totals) and tab setting. You can also add OLE object pages to your project: these contain data supplied and maintained by another application on your system, for example a page of spec notes produced using Microsoft Word. 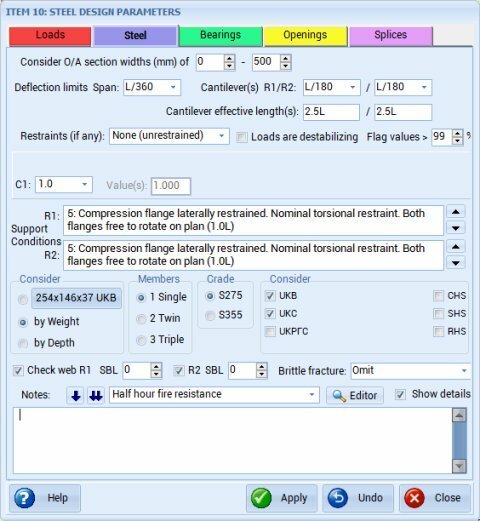 SuperBeam, ProSteel and EuroBeam use the same page heading editor. It splits the page heading into a grid of eight rows and four columns. The text in each cell can be left or right aligned or centered, and you can use any one of four (user selected) fonts. Lines can be drawn around cells as desired. Optionally text may be centered to the page rather than within a cell. You can create and save multiple page headings which can be switched at will. 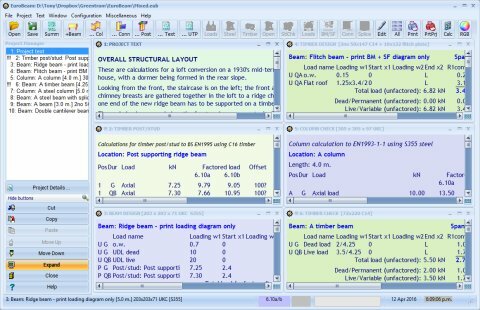 SuperBeam, ProSteel and EuroBeam share the same headings: any heading created in one of these programs is instantly available to the other. The demo version only allows viewing of calculations on screen. For first-time buyers, EuroBeam costs £250. If you've previously bought SuperBeam or ProSteel it costs £150 or £100 if you've bought both. If you have current update cover for SuperBeam or ProSteel, your EuroBeam update cover will run to the date when this expires.